The American toddler that survived a bizarre brush with death after a set of car keys became lodged in his brain, has appeared on the US Today Show. The shocking X-ray images show that when 20-month-old Nicholas Holderman fell onto his parent's keys on September 2, one entered his eyelid and penetrated his brain. His mother, Staci Holderman made an emergency call and Nicholas was airlifted to hospital for emergency surgery. 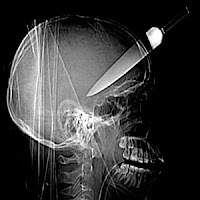 Although doctors were confident they had not damaged his brain when removing the key, they were stunned to find out 15 minutes later that his eye was also undamaged. Nicholas now has perfect vision in both eyes. Toddler Nicholas Holderman somehow escaped unharmed after landing on his parent's car keys and having one penetrate his brain. 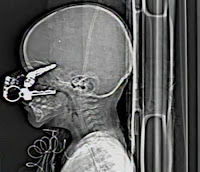 Police released this x-ray as part of a crackdown on crime in the UK. It showed a 16-year-old boy who had a knife stabbed into his head. A dentist discovered what was causing this consruction worker's toothache: a 10cm nail he had blasted up his nose. 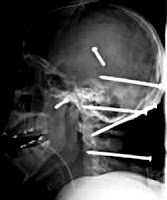 Not to be outdone, construction worker Isidro Mejia accidentally fired six nails into his skull in an April 2004 incident. He survived. An X-ray uncovered a 15cm pair of surgical scissors in Australian Pat Skinner's abdomen 18 months after an operation. Body snatchers once replaced human bones with PVC pipes as part of a body parts smuggling ring. This six-year-old swallowed magnetic block toys which reconnected when they hit his stomach. This person clearly got carried away with their dinner. Little Nicholas wasn't the first person to have an incident with car keys. This 3.6m python was saved by surgery after devouring a queen-sized electric blanket — complete with control box and cord. Eight month old Saint Bernard Elsie swallowed a 33cm serrated knife. After her operation, Elsie was left with a 20cm scar.